Meet Pug. Pug is one happy pup. He has his own yard, his own bowl, and his own cozy bed. That is, until Pig moves in! Pig eats from Pug’s bowl, interrupts Pug’s work, and, worst of all, sleeps in Pug’s bed. Will Pug and Pig ever learn to live together as friends? With adorable illustrations from Joyce Wan, this sweet and silly story about a darling duo shares the timeless themes of embracing change, being kind to others, and finding friends in unlikely places. For more fun with the book, here’s a four-color activity kit for kids of all ages. For more coloring sheets and a curriculum resource guide for teachers, go to Resources. Here’s the starred review from Publishers Weekly. If you would like an autographed or personalized copy of the book, call Rainy Day Books at 913-384-3126or go online to Rainy Day Books. Rainy Day Books welcomes special orders and ships books nationwide. To schedule a school or library visit, go to Contact. 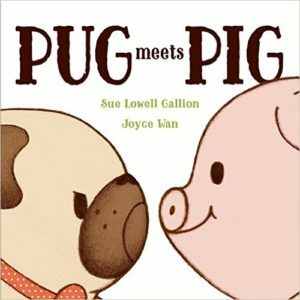 Look for or request Pug Meets Pig at your local bookstore or library. Ratings and reviews of the book on Goodreads and Amazon are always appreciated! Available now: Pug & Pig Trick or Treat!